Each Pam the Kindersinger program will have children up dancing, singing, and involved in every way! Puppets will join Pam- much to the delight of children and adults! Programs are tailored for Pre-K through 3’rd grades, Infant/Toddler, and Special Needs. These fun and exciting programs are ideal bookings for special events of all sorts at: schools, festivals, malls, museums, libraries, parties, corporate events, churches,synagogues, hospital pediatric wings, and parties. Interactive fun with original and familiar songs, dancing, storytelling, and lots of humor! The most popular Pam the Kindersinger show. A wide variety of holidays are celebrated including a gentle Halloween/ Pumpkin Watch, Christmas or Jingle Jamboree, Hanukkah, Winter Fun, Spring Fling, and Summer Fun. Features music, humor, puppetry, and audience participation. Interactive program makes it fun to eat healthy, exercise, and practice good hygiene. Original songs include: Food Group Boogie, Snack Jungle, You Are What You Eat, Toothbrush Tune, Cough & Sneeze, and many more! Thirty minute program geared toward babies 6 to 18 months with an adult. Combines songs, classic baby games, and puppetry to delight infants and encourage interaction with their adult. Thirty five minute program geared toward 18 month to 36 month toddlers with an adult. 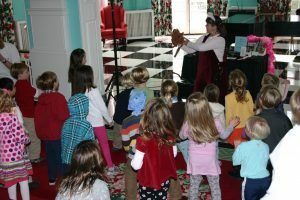 Interactive fun includes original and classic songs, games, and puppetry. A guaranteed enjoyable day for toddler and grown-up together! A great meeting for your daycare organization! Available workshop themes include Daycare Hints for Fun and Learning & Puppetry 101.